Daniel Handler aka Lemon Snicket is back about love and how it ends with his new novel WHY WE BROKE UP. Min Green (Blaine Morris) and Ed Slaterton (Keir Gilchrist) are breaking up, so Min is writing Ed a letter and giving him a box. Inside the box is why they broke up. Two bottle caps, a movie ticket, a folded note, a box of matches, a protractor, books, a toy truck, a pair of ugly earrings, a comb from a motel room, and every other item collected over the course of a giddy, intimate, heartbreaking relationship. Item after item is illustrated and accounted for, and then the box, like a girlfriend, will be dumped. 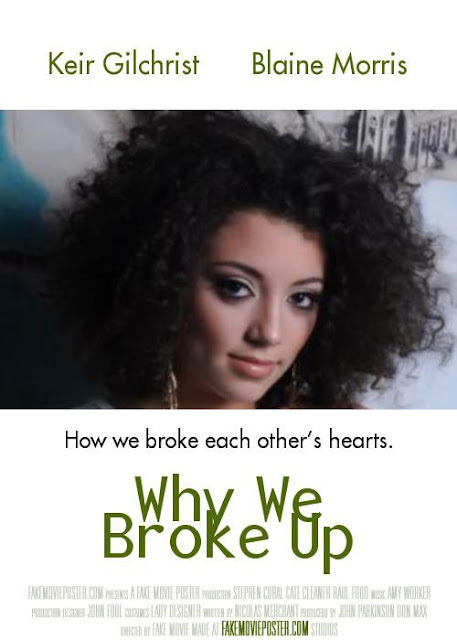 Be sure to check out other break up stories and more about the book at WHY WE BROKE UP PROJECT. Interesting crackship. Cool link, too. She would definitely be cool in this part. I read the book. It was different than I expected. I just never thought of these 2 as the main characters.